Summer Parties and Summer Costumes too! Get ready for the Fourth of July holiday weekend and don't forget some great costumes to put you in the summer party mood! Whether it is just a hat or a mask or a complete patriotic costume, it will get everyone in the holiday mood and ready to celebrate the Fourth of July! There is still time to order your 4th of July costumes, hats and accessories and have them delivered before the holiday. Make sure to order express delivery to arrive on Thursday, July 3rd since there will be no deliveries on Friday July 4th. Order Wednesday by 3pm EST select Next Business Day delivery. Don't let the fun stop after celebrating the 4th! Luau themed parties are a great idea for summer fun! What better excuse to dress in less for the hot weather? Ladies: a grass skirt over your bathing suit, or a beautiful floral sarong. Add a funny hat or accessory. Or, the most simple trick, is a flower lei for all your guests. It is easy and fun and inexpensive and instantly transforms everyone's look and mood as well! Play some Jimmy Buffet, Bob Marley or maybe even a Hawaiian luau themed CD! You can decide to have a whole luau menu, or maybe just add some pineapple, a tropical fruit salad, and some umbrellas in everyone's drink! Maybe some pineapple or mango salsa added to your hot dogs and hamburgers! Little touches can really add to the theme and enhance everyone's luau party experience! Cheers, have fun and stay safe! Heath Ledger is getting a fond tribute from his collaborators on "The Dark Knight"
The end credits of the "Batman Begins" sequel include a farewell note to Ledger, who died in January from an accidental overdose of prescription drugs; and to special-effects technician Conway Wickliffe, who was killed last September in a stunt-car accident. "In memory of our friends Heath Ledger & Conway Wickliffe," reads the tribute included in the credits, which went up Thursday on the Warner Bros. publicity Web site. Ledger plays the villainous Joker in "The Dark Knight," who begins a reign of terror on Gotham City that pits him against conflicted hero Batman (Christian Bale). Arriving in theaters July 18, the movie reteams Bale with director Christopher Nolan and returning co-stars Michael Caine, Morgan Freeman and Gary Oldman. Joining the cast are Aaron Eckhart and Maggie Gyllenhaal. Beginning months before Ledger's death, his frenetic performance and demented-clown makeup have been a cornerstone of the marketing campaign for the film. "I needed a phenomenal actor, but he also had to be someone unafraid of taking on such an iconic role," Nolan says in the production notes for "The Dark Knight." "Heath created something entirely original. It's stunning, it's captivating. ... It's going to blow people away." Something new and exciting is coming! AnniesCostumes.com is getting a new design, a new look and feel. Stay tuned! Our new design is coming in the next few weeks and we just can't wait to share it with you! Every year Extreme Halloween publishes a list of their predictions for the most popular Halloween costumes. Now here is your chance to pick your favorites and let us know your Halloween habits. And when you take our 8 question Scary Halloween survey, you will be entered in our weekly drawing to win prizes. Share your predictions and favorite costumes with us! Celebrating the 5th anniversary of the Top Halloween Costume List. See our list of the costumes we predict will be the most popular this Halloween. There is something for everyone on our list: babies, girls, boys, teens, men, women, couples, groups and more! Dania Beach, FL (PRWEB) July 1, 2008 - As stores gear up for their annual Christmas in July sales, AnniesCostumes.com offers fun ways for everyone to get into the mood for this wacky summer holiday. For Christmas in July celebrations that include an actual theme party or cookout, AnniesCostumes.com, one of the leading online costume retailers since 1996, offers a complete line of props, decorations and accessories, including kitschy and traditional child and adult Santa suits from www.SantaSuits.com. But, a party or a picnic isn't the only way people can celebrate this wacky holiday. Second Life is the perfect place to get into the "Christmas" spirit with adult Santa suits and costumes for avatars, as well as a virtual Christmas Village. When first arriving to the virtual Christmas village, avatars are greeted with snowflakes falling on their heads. A large, ice covered pond with a Christmas tree in the middle has free ice skates nearby so Second Life residents can get in a little ice skating. Santa's home sits in between two workshops where avatars can drop in for some milk and cookies before shopping for wacky holiday items and adult Santa suit costumes. AnniesCostumes.com Second Life Christmas in July celebrations by visiting http://slurl.com/secondlife/LeftBank%20Studios/184/80/41/?title=AnniesCostumes.com. Not on Second Life? No party planned? Well, the wacky Christmas in July holiday can still be celebrated with the "Santa Dress Up" game, http://www.santasuits.com/dressup/. This free, interactive game lets players dress up ole' St. Nick as wacky characters for the holidays with such styles as "Sumo Santa," "Elvis Claus," "Super Santa" and more. Users can just drag and drop a variety of shirts, pants, shoes, hair and accessories they'd like onto Father Christmas to create a unique Santa for Christmas in July. About Annie's Costumes Annie's Costumes (www.AnniesCostumes.com) is part of the Extreme Halloween Network. Extreme Halloween Network is the web's most complete source for online costumes for all holidays and occasions. They have sites devoted to costume accessories for all wacky holidays, theater makeup, costume wigs, Christmas in July adults Santa suits, western wear, gothic fashions, magician supplies and more. 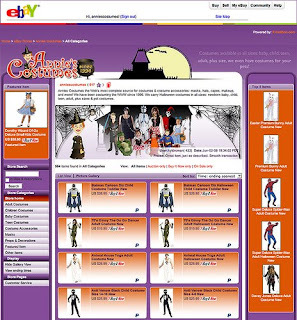 Annie's Costumes has been one of the leading online Halloween costume stores for internet shoppers since 1996. If you're hungry for a great celebration on the 4th, check out this one-stop compilation of sites for great ideas, tips and advice on cooking up a memorable Independence Day get-together, backyard party or family picnic. And if you want to launch your party into the stratosphere, have everyone come in a patriotic costume (from anniescostumes.com, of course!). Kate's Global Kitchen - The Fourth of July southern style, with recipes for Chilled Southern Spiced Shrimp, Pulled Pork, spoon bread, snap beans, Pralines and Peach Crisp. 4th of July Party Ideas from Evite - The online party invitation station, also offering great ideas for food and drinks, party games, music & activities. One of my favorite parts of going to the movies, besides the popcorn (and the movie itself, of course!) are the previews! When I saw The Incredible Hulk this weekend, we saw previews for Hell Boy 2 and The Mummy 3. These two sequels looked really thrilling and will be sure to be packed with some great sci fi action too! I really don't remember a summer that delivered as many great movies as summer 2008 has already delivered and promises to keep them coming straight through to the fall! AnniesCostumes.com has been selling online since 1996 and for many years we have offered a few items on Ebay from time to time. Now with our new eBay stores design featuring Frooition eBay Stores technology and iBussinessLogic graphics we will always have great costume deals up on eBay, both in our store and close out auction prices. So check out the spiffy new Annie's Costumes eBay store and get yourself a great costume deal today! Special thanks to my awesome internet marketing consultant, Jay Berkowitz from Ten Golden Rules for introducing us to Scott Pooler and the iBusinessLogic team. You can see both of these Internet gurus at eBay Live in Chicago later on this week! Greatest American Dog reality show coming to CBS July 10th. Summer TV really is going to the dogs, but in a totally good way. All you dog lovers and costume lovers alike, be sure to tune in to check out the competition and the cute pups performing tricks! AnniesCostumes.com provided the show with tons of dog costumes and accessories as well as some matching costumes for their human companions. I am so excited to see how the teams use the costumes to express their personalities in the competition! According to this review, the latest horror thriller from M. Night Shyamalan is a letdown. What a great idea is "The Happening." The latest horror thriller from M. Night Shyamalan benefits greatly from Shyamalan's highly intriguing premise. But it suffers just as much from Shyamalan's weak dialogue, stilted direction and inability to connect with his actors. In the best of all possible worlds, he would have developed his story and then handed it off to someone else to write the script and direct it. But this is M. Night Shyamalan, who burst onto the scene with the extraordinary "The Sixth Sense" and followed up a film later with the powerful "Signs." Since then, however, he has seemingly lost the magic. "The Happening" shows flashes of his old brilliance, especially in the last 10 minutes. But getting there is not worth the effort. Mark Wahlberg is absolutely and atypically dreadful in the role of a Philadelphia high school science teacher. Some unknown incident in New York City causes people to become disoriented and kill themselves. The immediate thought is that it was caused by terrorists, and, just to be safe, Walhberg's character decides to flee to the country with his wife and a fellow teacher, played by John Leguizamo. When Leguizamo is no worse than the rest of the cast, you know you're going to be in for a rough film. Especially when the cast includes the usually solid Zooey Deschanel, who plays Wahlberg's wife. As the three of them and the daughter of Leguizamo's character head deeper into the country, they meet a number of character actors who are no better than the rest of the cast. Things finally improve toward the end, when they encounter a crazy woman played by Betty Buckley. Finally, Shyamalan creates a character who interests him, someone who is Hitchcockian. Tak Fujimoto's cinematography is crisply evocative, as always, and even James Newton Howard's musical score helps set the mood. But the mood is consistently sabotaged by Shyamalan and the actors he has hired. Everything about the film feels forced, from the dialogue to the way it is said. And even when Shyamalan does the right thing with his camera, which is most of the time, it doesn't have the conviction of its movements. We can watch it and appreciate what the film is trying to make us feel, but we never feel it. The movie's best feature is the premise, that something in the air reverses the inhibitors in the brain that keep us from harming ourselves. The images of people stopping dead in their tracks and then finding ways to kill themselves are chilling -- or they would be if they were executed better. One bit, involving a policeman's gun, is particularly effective. But then, we learn what is causing this all to happen, and the reason is especially stupid. We waited the entire movie, we think, for this? The Incredible Hulk Movie Smashes Its Way Back Into the Hearts of Fans! Yeah for Marvel! They saved the Hulk in an unprecedented recovery from the 2003 box office bomb. It seems that I am not the only one that loved this action packed Marvel creation. Both fans and even critics are smashing the previous bad conception and bad taste that the old Hulk movie left in their mouths. The Incredible Hulk was #1 at the box office this weekend, opening with over $54 million in sales. The Incredible Hulk was a perfect blend of action and story line; with plenty of comic book accuracies and nuances for the comic book fans as well as a lot of aspects from the 1970's TV Show. The Incredible Hulk Costume with all its green muscles will no doubt be tops this Halloween season and available in both child and adult sizes. ComingSoon.net/Superhero Hype! visited the set of DreamWorks' upcoming comedy, I Love You, Man, and got a chance to talk to Iron Man director Jon Favreau, who plays a role in the comedy, opening in theaters on January 16, 2009. The comedy co-stars Paul Rudd, Jason Segel, Jaime Pressly and Rashida Jones. With Iron Man 2 already set for an April 30, 2010 release, they asked Favreau for an update. He talked about the sequel, the other upcoming Marvel Studios movies and even films like Hancock and The Dark Knight. Read the entire interview here. Dania Beach, FL (PRWEB) June 10, 2008 -- Fireworks, food and fun aren't the only things to look forward to on the Fourth of July. Fun patriotic costumes and decorations, including campy Uncle Sam and Statue of Liberty Costumes, George Washington costumes, Betsy Ross costumes and colonial costumes, are a must-have for any Independence Day picnic or pageant. Annie's Costumes, the premier online costume retailer since 1996, has a variety of July 4-themed costumes and decorations available, including All American Costumes - from Uncle Sam to the Patriotic Lady; American History Heroes - including president from George Washington to Nixon and historical character costumes; and fun July 4 party accessories such as beads, hats, masks and more. 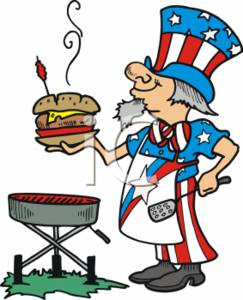 And, who wouldn't want Uncle Sam as the grill master at the family BBQ? Dressing as Uncle Sam can make the family BBQ or picnic so much more fun and flavorful. "Anyone can kick their July 4 party up a notch with themed costumes and accessories," said Shari McConahay, marketing director for Annie's Costumes. "Kids and adults have a blast dressing up as famous presidents - from our George Washington costumes to our masks of Kennedy and Clinton. And, don't forget Uncle Sam!" she added. Summer camps and daycares putting on July 4th pageants also need to look no further than Annie's Costumes for all their production needs. Annie's carries a full line of stage and theater makeup as well as outfits from traditional colonial and Betsy Ross costumes, to Uncle Sam and Statue of Liberty costumes, flags, hats and accessories for a modern-day celebration. See their site for a cute slide show of past costumed meal winners! 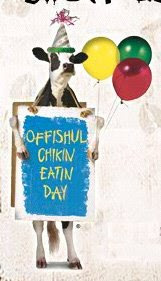 Dress like a cow, or wear cow accessories or makeup to your local Chik Fil A and receive a free entree. Kids get a Kids Meal. Even cow print accessories might get you a free meal. What a fun way to dress up!